MAYFIELD VILLAGE, OH--(Marketwire - June 4, 2007) - Incredible advances in veterinary medicine and higher expectations of veterinarians by doting 'pet parents' have spawned new treatments for pet diseases and injuries that might have previously been fatal. But they can cost thousands of dollars. As a result, millions of dog and cat owners often face a horrible dilemma: either struggle to pay a huge vet bill or reluctantly euthanize a loved pet. "Nowadays, responsible pet parents must have a financial plan that avoids the possibility of a pet health decision that is contingent on family finances," says Laura Bennett, a leading pet life and health actuary. She is launching Embrace Pet Insurance to offer pet owners an affordable, practical and, above all, uncomplicated solution to a growing problem. "It's not uncommon to see a vet bill run into several thousand dollars -- but how many pet owners can write a check that large?" Bennett and co-founder Alex Krooglik spent months surveying and talking with pet owners to better understand what they wanted from a pet insurance plan. Based on this customer research, they designed Embrace Pet Insurance to address some key failings of today's pet insurance plans. The biggest complaint they heard from pet owners is that pet insurance plans often do not reimburse the amount people expected. This is because some plans pay claims based on a fixed 'benefit schedule' that limits payouts. Bennett and Krooglik decided that pet owners should be reimbursed a larger portion of their expenses, and designed policies that reimburse based on actual vet bills. Another common complaint: some pet insurance plans are ambiguous about their coverage of genetic and congenital conditions, and deny claims that pet owners expect to be covered. Embrace listened and included coverage for genetic conditions, including cancer, into all of its plans. Bennett and Krooglik also heard that some insurance plans define an illness diagnosed once coverage has begun as a 'pre-existing condition' in subsequent years, and therefore excluded ongoing treatment for recurring or chronic conditions. Embrace Pet Insurance lets pet owners choose whether they want this coverage for chronic conditions. "What we offer is pet healthcare insurance that functions more like human health insurance, and that gives pet owners what they expect from insurance -- reliable coverage that pays," says Bennett. "And we make it very easy for people to specify an insurance plan that meets their needs and fits their budget." Embrace lets pet owners build a custom pet insurance policy tailored to their budget. The pet owner specifies maximum cash outlay, deductible, co-pay, and optional coverage. In total, there are potentially thousands of different combinations but the beauty of the Embrace approach is that everything is packaged into an easy-to-use process that requires less than 60 seconds to get a quote, and only a few more to buy a policy. The application is completed online, the policy is clearly explained, and then delivered via e-mail just seconds after purchase. 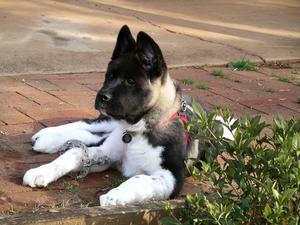 Norma Jean Kern of Hickory, North Carolina, has owned several Akitas over the years, and recently experienced firsthand how a freak accident can lead to major vet expenses. "Our dog, Storm, was attacked by the neighbor's dog, which managed to dig under our fence, bite him, and then wouldn't let go. Storm suffered severe leg injuries," she recalls. "We rushed him to the vet. For a while it wasn't certain he would survive, but he made it. Now, six months and many vet visits later, he's back to his normal enthusiastic self." Storm's treatment required several surgeries, a special brace, and a custom walking cast. The vet bill was over $3,000. "After seeing huge vet bills with other pets, I signed Storm up for insurance shortly after we got him. Embrace has paid all my vet bills, without any hassle. In fact, they even called me every now and then to check on his progress. I wish all health insurance -- human included -- took this approach." Embrace Pet Insurance Agency LLC is a specialist insurance agency headquartered in Mayfield Village, a suburb of Cleveland, Ohio. Embrace was founded by Laura Bennett and Alex Krooglik, pet parents who also happen to be insurance experts, and offers self-serve, customizable pet health insurance for dogs and cats. All policies are underwritten by certain underwriters of Lloyd's of London. Embrace is based on core principles of taking an open and honest approach with its customers that is captured in its Customer Bill of Rights. On the web at www.embracepetinsurance.com and at http://blog.embracepetinsurance.com.